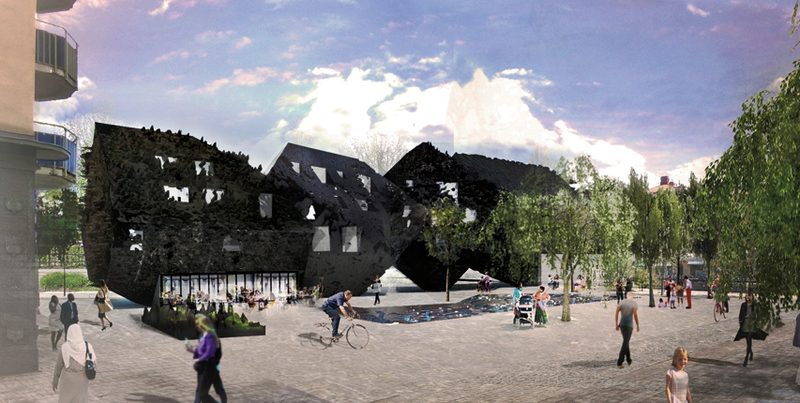 Blockterräng / boulder cluster, is a proposal for a residential/public-use building on the central square of Katrineholm, Sweden. 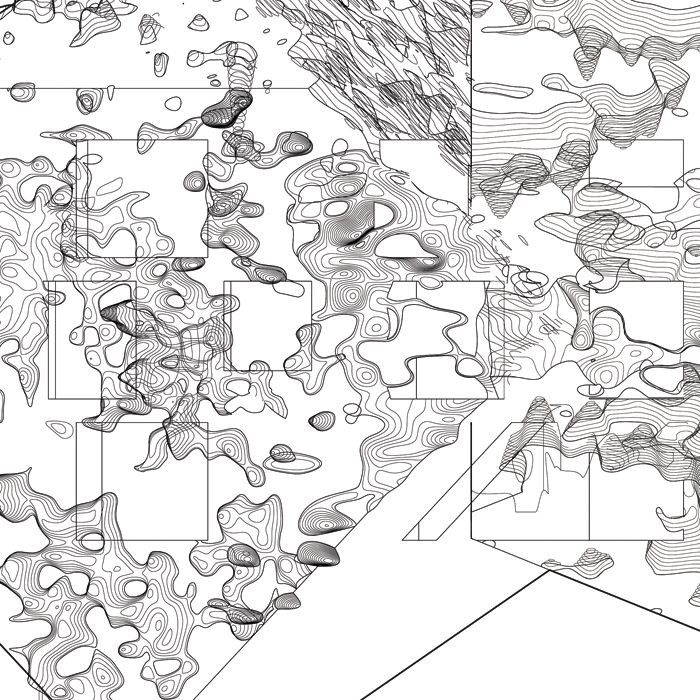 The project considers the connection between architectural form and forms derived from elements of landscape. Specifically, the relationship between classical rustication techniques and their reference to the stone substrate of the ground is recast in the context of contemporary architecture. A boulder cluster is a small, distinct group of large stones located in such close proximity to one another that they cannot be identified individually. The proposal Blockterräng is visible from the city and from the train that runs adjacent to the site, connecting Stockholm with Gothenburg. The new building volume frames the central square while creating links with the urban context, extending beyond the square, over the road and track area to the main station and public buildings on the other side of the railway. The building volume with its deep facades and rich detail, protects against noise from the road and track area, while framing housing with generous terraces and views. The building mass has a small footprint at the ground level that opens up circulation between the main square, the bus stop area and other public activities. 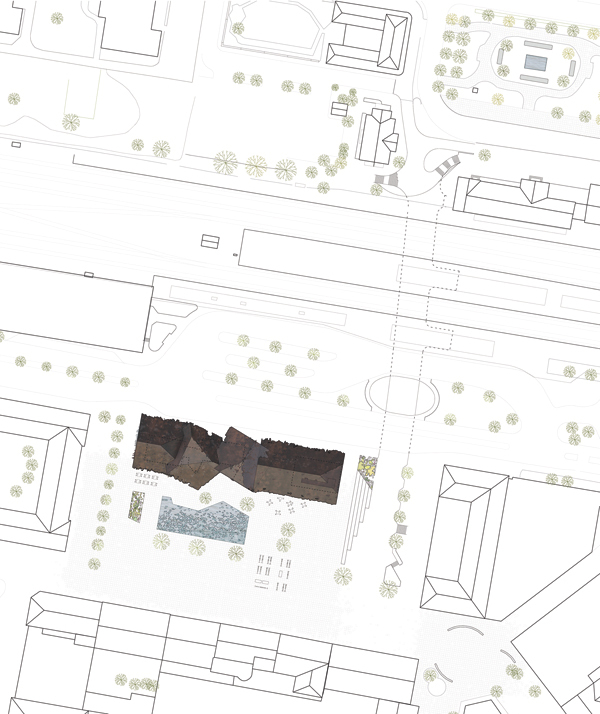 A large open square has been designed to accommodate an outdoor market and a large fountain, referencing the local typology of fountains in public squares. The building contains a restaurant, cafe and flower shop at ground level. The square is programmed as a space for short errands as well as to stop, sit down and meet. 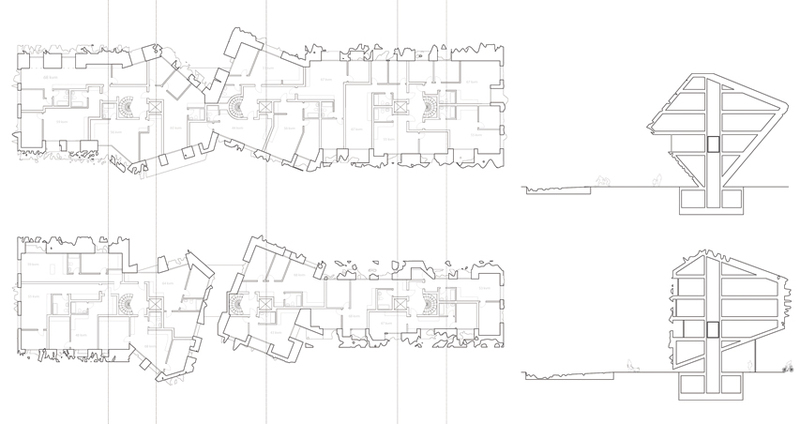 Four variable building masses, with differential facade orientation, are bound together by rustication. In classical rustication the stone is textured to create a rough external surface at the base of the building that contrasts with the smooth surfaces of ashlar (finished) masonry on the upper stories, mediating between the roughness of the ground and the refined tectonic of the architectural form. An additive (positive) as well as a subtractive (negative) rustication protrudes beyond the facade line and creates concavities or niches. 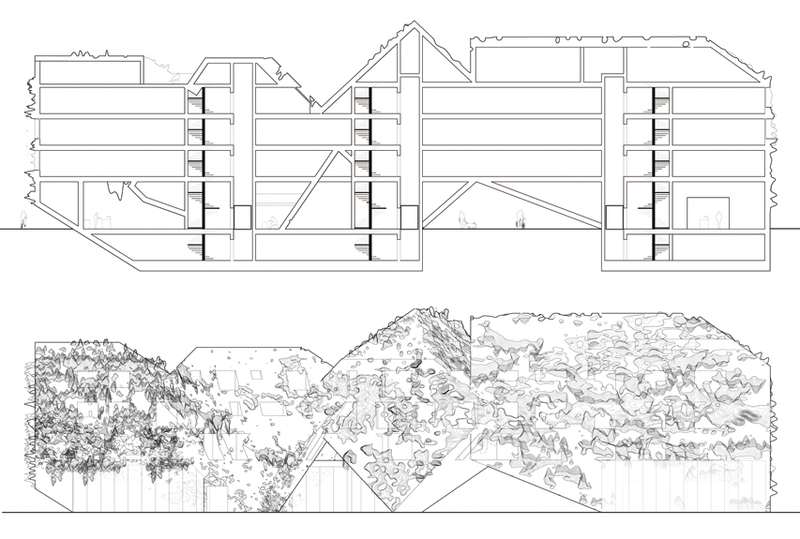 In this project, rustication is used to suggest a connection between the materiality of the ground and the entire building mass, thus it proliferates, becomes over-scaled and migrates to unlikely locations in respect to the architectural body. 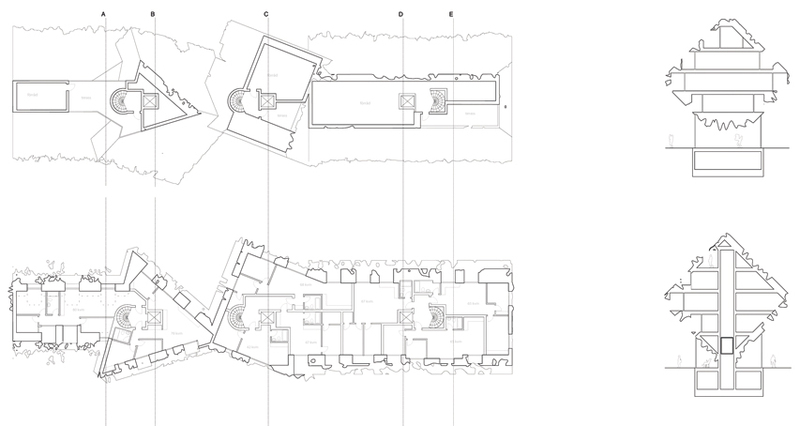 The massing of the building is based on polygonal forms that refer to finely cut ashlar, trapezoidal or polygonal masonry, while the smaller scale surface articulation serves as a contemporary form of ornamentation. The masses that comprise the building (akin to several large stones or boulders) are situated to create a façade that has multiple orientations. Thus while the new building as a whole completes the 'urban wall' of the central square and establishes continuity with the buildings on the opposite side of the square, it also creates the effect of several smaller masses that have been combined. The four building masses are all black, but constructed in different materials; wood, ceramic and concrete. This creates variation while maintaining the continuity of the whole ensemble.